The Gandhak ki Baoli and Rajo.n ki Baoli (or Rajo.n ki Bae.n) are famous in Mehrauli. However, very few know about the underground Baoli of Dawood and lost Baoli of Aurangzeb, situated on either sides of Zafar Mahal. 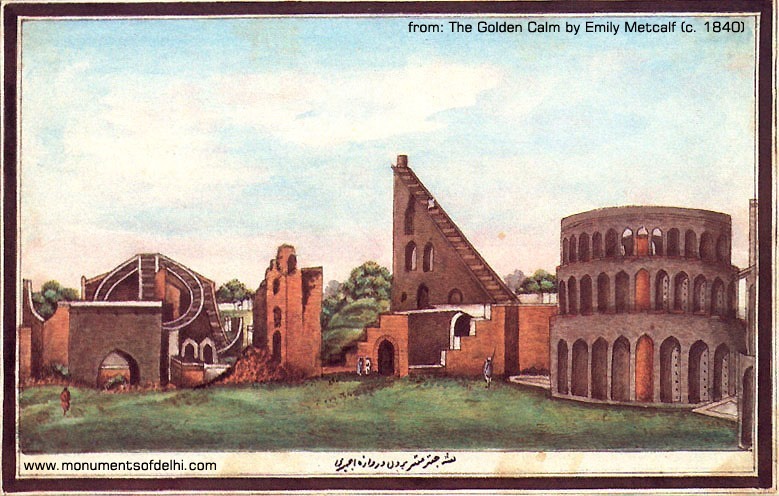 To the west of Zafar Mahal, there once existed a Baoli, said to have been built by Aurangzeb. It must now be buried somewhere under the houses. However, Dawood’s strucure is in more accessible shape. Each day, hundreds of devotees flock to the shrine of Hazrat Khwaja Qutubuddin Bakhtiyar Kaki (r.a.) in Mehrauli, Delhi. 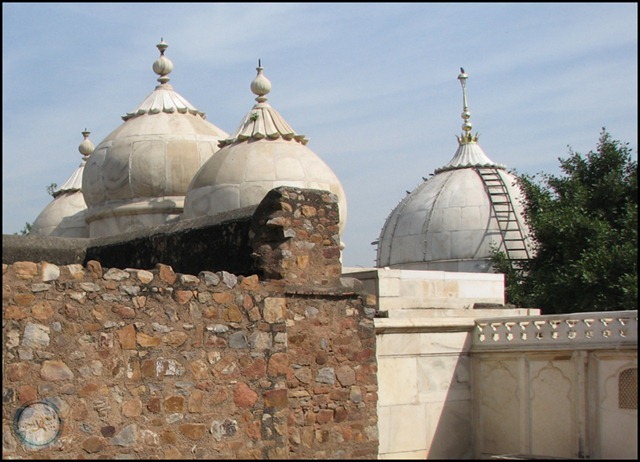 Khwaja Kaki was the spiritual successor of Hazrat Khwaja Moinuddin Chisti (ra) of Ajmer. Numerous stories associated with his life make this area more important for devotees. With so many disciples coming in, basic necessities like Caravan Sarai with adequate supply of food and water was very important. It is said that one of the prime disciples of Khwaja, Sultan Iltutmish commissioned a Baoli in Dargah Complex. Situated in the rear of complex, near Majlis Khana, the Baoli today is hidden and hardly known. In 1844-46, a person named Hafiz Dawood spent Rs. 14,000 and built a huge audience hall over the steps of Baoli. He is said to be a favourite of Emperor Bahadur Shah Zafar. 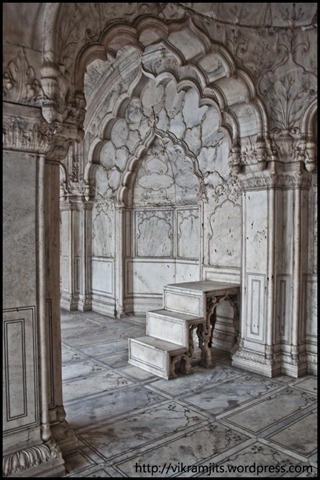 The roof of this Baoli is now well covered with marble and appears to be regular floor of Dargah compound, hiding the steps and tank beneath it. A small slit in floor in the south west corner, approached through the maze of few graves, lead you to a flight of steps that result in a locked door. The dedicated manager of Dargah, Janab Fauzan Ahmed, who is trying his level best to keep this Baoli clean and bring it back to life is always more than eager to open this lock for you and make the Baoli more popular. As the door opens, you reach a hall, built by Dawood. It has huge colonial columns and girders with roof slabs. Another side leads you to the steps, that take you to the tank of Baoli. It was recorded that this Baoli is about 75 feet deep and this depth is scaled with just 74 steps. This 96 feet by 42 feet rectangular structure is built with rubble masonry and panelled recessed arches. The Baoli was open till early 1990s. People used to bath in it. Then it was closed due to some reason. Towards east, the Well exists, which is open from top and covered by high rise houses on 3 sides. Unfortunately, houses connected to this Baoli used this well as a garbage pit. It was filled with garbage till 2013 and appeared to be totally dry. The Baoli was in a bad shape and well was more of a dumping pit. In 2013, government decided to clean it. By November 2013, in just 25 days, they had cleaned 5 meters, or roughly 600 cubic meters waste. During a conversation, I was informed by one of the seniors at Dargah that contractor who was employed by SRDC & PWD to clean Baoli tried to skip hard-work. He offered bribe to Dargah management, to file a report mentioning work completion to satisfaction. However, the honest Manager, Mr. Fauzan (in pic) refused. He returned that money to contractor and asked him to invest it further to clean it. He also informed government officials about this incident. As a result, Contractor had to work further and 5 more feet were cleaned, resulting in the Baoli getting filled with clean water. Had Mr. Fauzan accepted that bribe, this Baoli would still have been dry and dirty. We also find traces of some restoration work done by end of 1800s or early 1900. This is confirmed by the use of an iron girder, that bears the date 1898. Karol Bagh, the busy market of Delhi, has a hidden secret. The area is identified by Delhi’s new landmark, the huge Hanuman Statue next to Bagga Link Services. Right behind this Bagga Link, a small serpent road goes deep into the Southern Ridge of Delhi. As you advance few hundred meters on this road, a strange structure on your right will cast a spell on you. 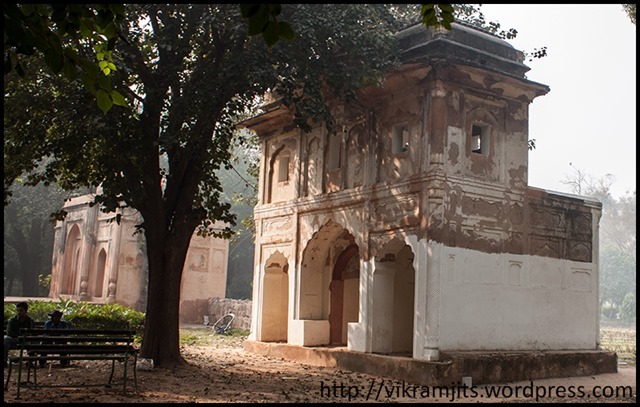 This structure is claimed to be the most haunted place in Delhi. There are no metal gates to be locked. The only thing that guards this massive structure is a note written at entrance, which tells people to not to come near this place after sunset. I had an unofficial chat with one of the govt employees associated with this place. He told me that no security guard deployed by govt survived his job for more than 2-3 days. He added, “I don’t believe in all this, but there is something suspicious & scary here”. 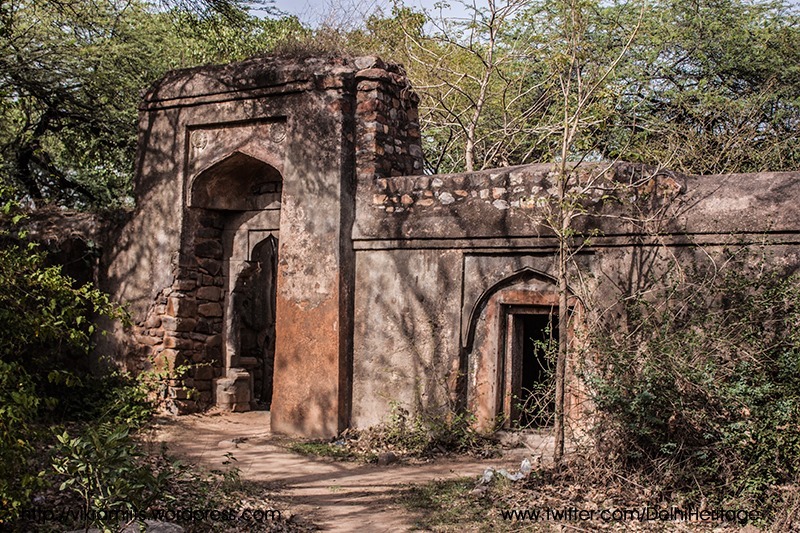 Bhooli Bhatiyari (or Bhuli Bhatiyari ka Mahal) is a Hunting Lodge built by Feroz Shah Tughlaq in 14th century. It has its resemblance with another of Feroz Tughlaq’s structure, ‘Malcha Mahal’. The structure is entered by a huge rubble masonry gate, which takes you to a small zone. Another doorway with corbelled arches welcomes you to the huge open square courtyard. On sides, we have rooms, used by people who stayed here during the hunting season. Towards north, it has a semi-circular structure accessed through a plight of stairs. On one corner, we have a modern toilet, which was built by Delhi Tourism in hope to promote this place. But it lies deserted as no govt guard was able to come near this place. We can imagine, that the hunters back in Tughlaq days could have seen the entire ridge from this mini-fortress. 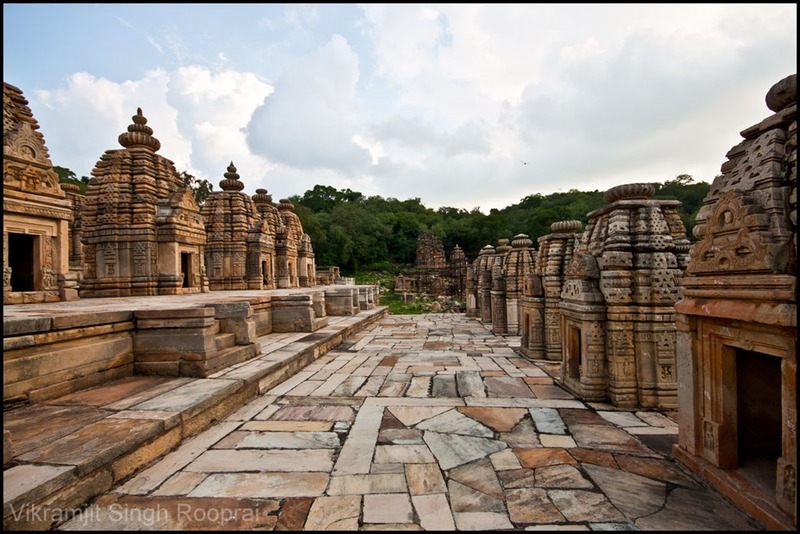 This structure also has those elements, which are commonly seen in Mosques and Palaces built by Junan Shah Tilangani. On outside, the Lodge has bastions like a fort. The entire plan of this Lodge appears as if this was a safe house of the Emperor during some calamity. Why the name “Bhooli Bhatiyari”? There are two theories behind this title. One theory suggests that this place, after the Tughlaq Dynasty, became abode of a sufi saint named ‘Bu Ali Bakhtiyari’. Bhooli Bhatiyari is simple a distorted form of his name. The other theory suggests that there was a Bhatiyarin (a tribal lady from Rajasthan), who forgot her way and ended up here. After her, the place became famous as ‘Bhooli Bhatiyari’. Personally, I never had any haunting experience at this place. I have been there alone, with family, friends and with huge groups during Photowalks. But perhaps the scaring spirits in this area don’t like me. The closest we went were when we were doing a Photowalk and 2 of our group members decided to drift away from the group. They went deep into jungle and tried to click a white wall that they saw. When they adjusted their cameras, standing next to the wall, they realized that the wall just vanished. They came back running to me and narrated the story. If you have experienced anything special here, do share with me. On one fine day of 1719 AD, the courtiers of Mughal Emperor Muhammad Shah were having a heated argument about how to accurately calculate the auspicious date and time for Emperor’s travel plans. While they were fighting with each other, one member of the Mughal Durbar was sitting quietly, thinking, why don’t we have an instrument, which can give very accurate date and time. By this time, this courtier had decided that he will construct a high precision astronomical observatory. This courtier was Saramad-i-Rajaha-i-Hind, Raj Rajeshwar, Shri Rajadhiraj, Maharaja Sawai Jai Singh II, Maharaja of Amer (later Jaipur). He was an ally of Mughals and had great interest in mathematics, architecture and astronomy. After the debate in court, he held a discussion with the Mughal Emperor, and took his approval on constructing astronomical observatories. Jai Singh was influenced primarily by the Islamic school of astronomy. He studied the work of the great astronomers. Early Greek and Persian observatories contained elements that Jai Singh incorporated into his designs, but the instruments of the Raja Jai Singh’s observatories, are more complex, or at a much greater scale than any that had come before, and in certain instances, are completely unique in design and function. 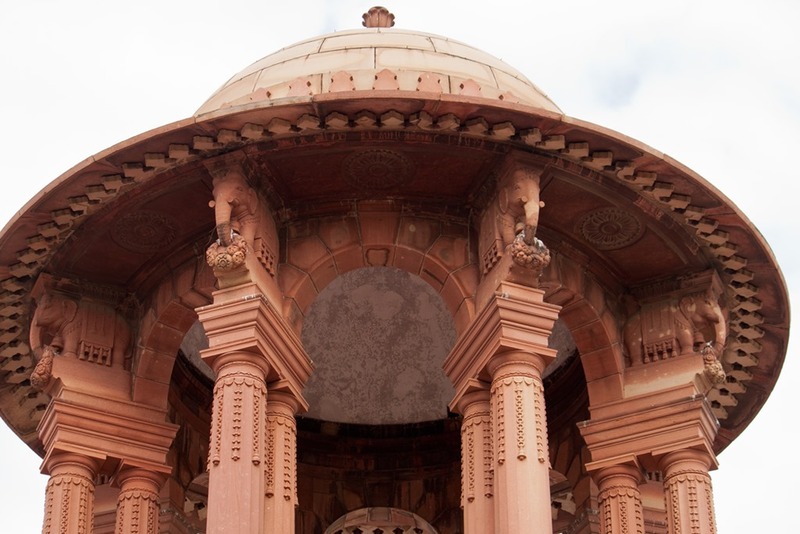 The first observatory was built in Delhi. Some people argued that the observatory was built in 1710, but Sir Syed Ahmed Khan, author of Athar-us-Sanadid correctly calculated the date as 1724. 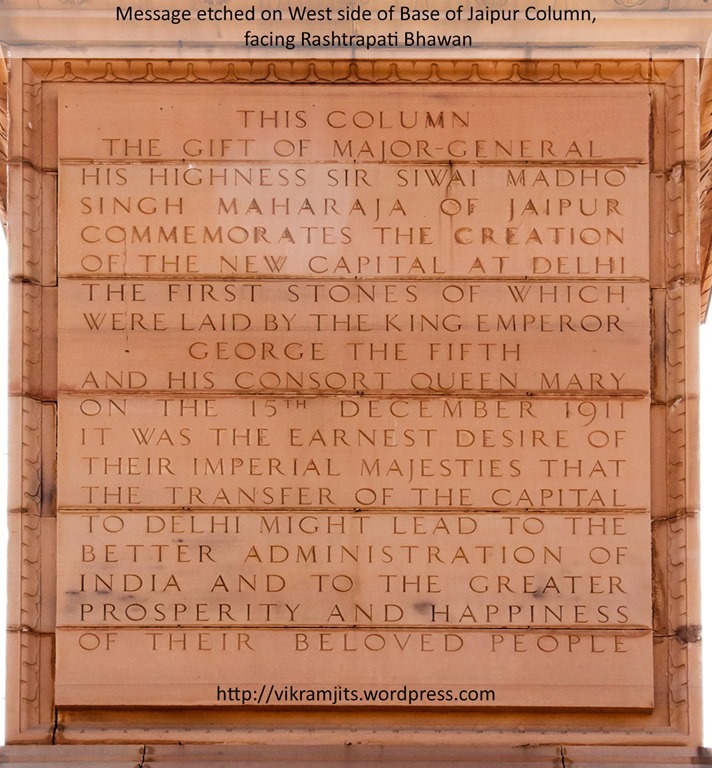 Raja Jai Singh had his estate near Delhi, which was known as JaiSinghpura. 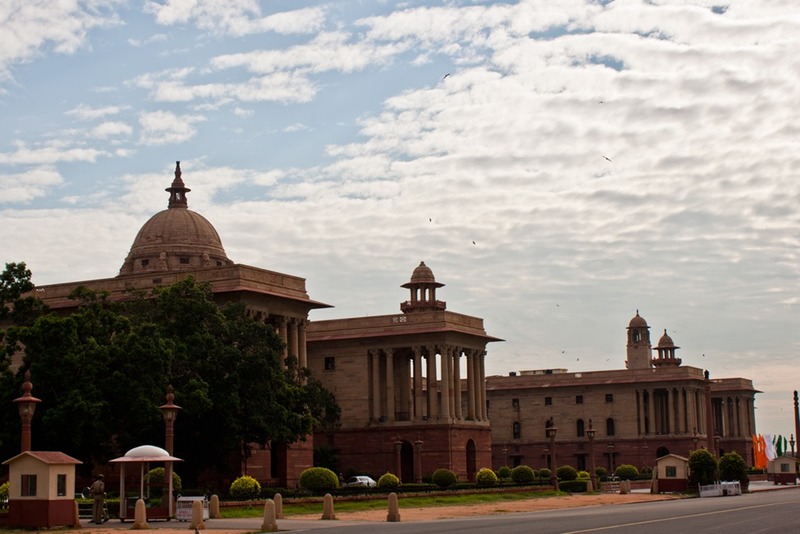 This estate today comprises of area from foot-hill of Raisina to Janpath and parts of Connaught Place. His palace/haveli/bangla was used by 8th Sikh Guru and is today known as Gurudwara Bangla Sahib. After this first observatory in Delhi, he built similar observatories in Jaipur, Benaras, Ujjain and Mathura. 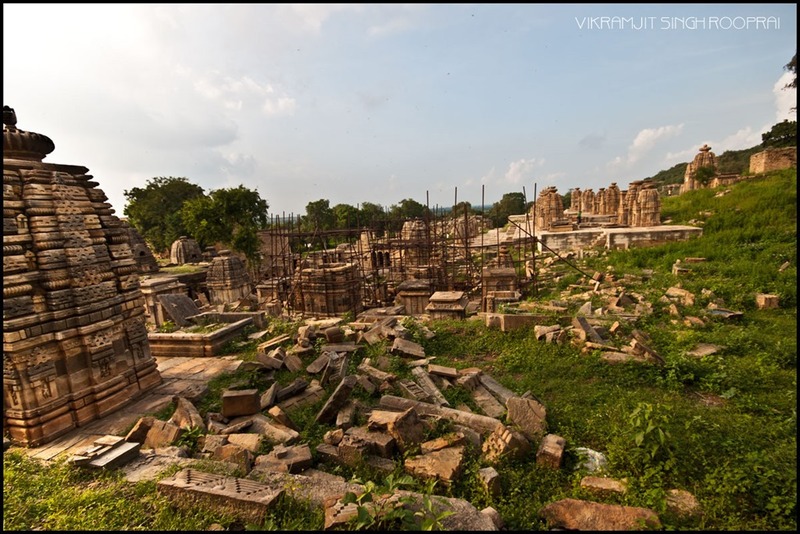 The Ujjain observatory was painfully demolished by land mafia. Out of other 4, only the largest sundial, the Jaipur observatory is operational because rest 3 are surrounded by high rise buildings or trees, thus obstructing sunlight. All these observatories are accurate to half of a second, which is better than European instruments available at that time. Originally, these observatories were called “Yantra” or “Yantar”. In many north Indian accents, people often pronounce “Y” as “J”. Thus, Yantar soon became Jantar. “Mantar” means a formula, or in this context, a calculation. 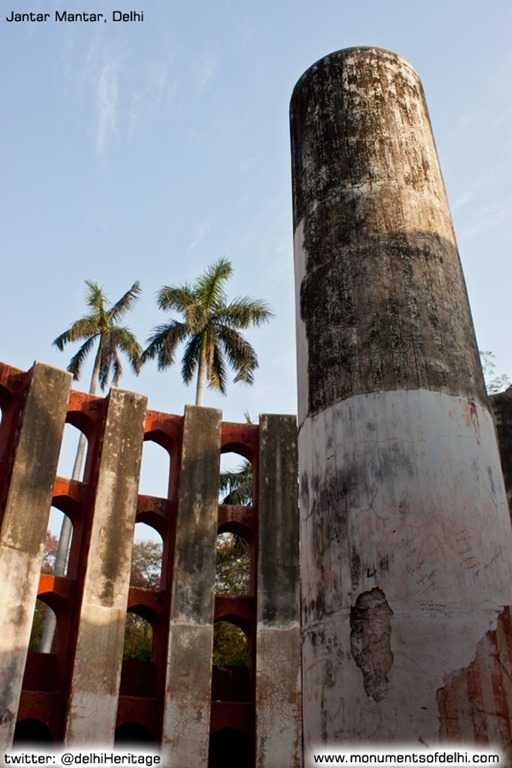 Thus we get the present name for these observatories “Jantar Mantar”. Samrat Yantra (supreme instrument): is ‘an equinoctial dial. It comprises of a triangular gnomon with the hypotenuse parallel to the earth’s axis, and on either side of the gnomon is a quadrant of a circle parallel to the plane of the equator’. Jai Prakash Yantra: This consists of two concave hemispherical structures to ascertain the position of the sun and other heavenly bodies. It has a long tower with stairs attached to it, from which, the experts would accurately calculate time. Ram Yantra: These are twin structures, circular in shape with pillar in centre. The walls and floor of which are graduated for reading horizontal (azimuth) and vertical (altitude) angles. 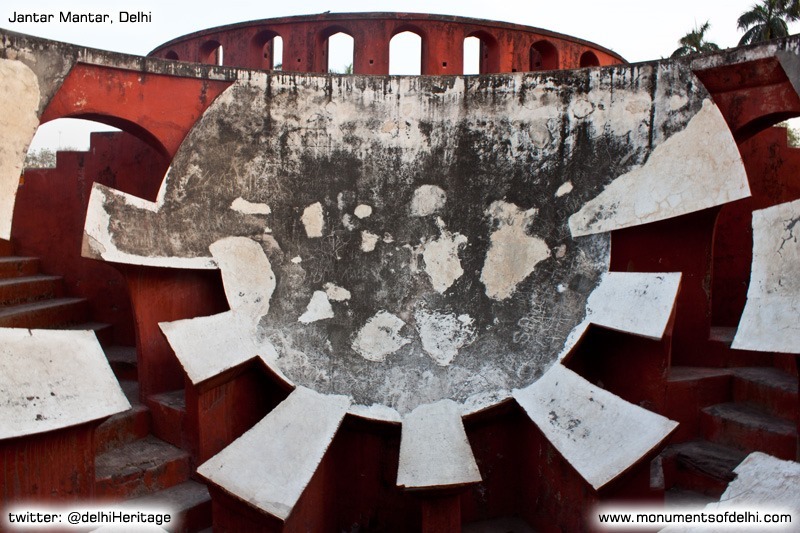 The Jaipur Jantar Mantar on the other hand, consists of 14 major instruments. These include the instruments from Delhi Observatory. Jantar Mantars are instruments of high precision and excellent craftsmanship. Unfortunately, we have lost the art to modern clocks. However, we must respect the talent and hard work of our forefathers, who made the modern day possible. In my series of articles on Taj Mahal, I am going to introduce you to an interesting episode of our history, where one of the British appointed Governor General, Lord William Bentinck, who had absolutely no respect for or interest in Indian Heritage, decided to auction off the Taj Mahal. When celebrated English author, poet and illustrator Edward Lear wrote the quote mentioned above, he tried to depict the mesmerizing sight of the great Taj Mahal. Countless visitors since ages have praised the beauty of Taj. But one man, sitting on the top position had some other evil plans about this beauty. 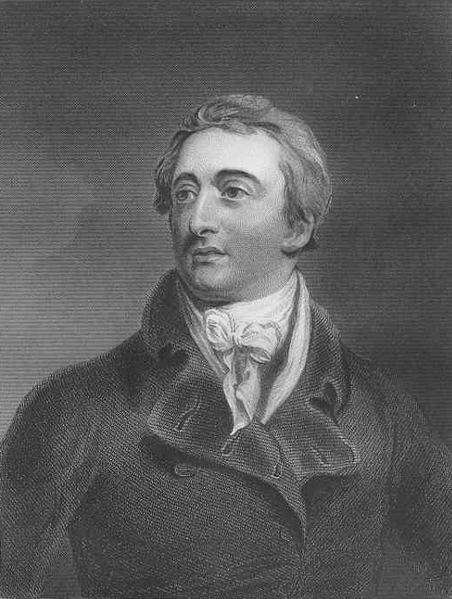 Lieutenant-General Lord William Henry Cavendish-Bentinck became the Governor General of India for just two years from 1833 to 1835. In these 2 years, he saw the bad state of finances. To improve the financial state of the government, he took a very stupid decision, which was to auction, what we today regard as the ‘Wonder of World’. During British Raj, it was a practice of Rich British families to visit decorated Mughal buildings and dig precious stones to be taken back as souvenirs. Taking a hint form this malpractice, Lord Bentinck decided to dismantle the Taj Mahal and auction off the precious marble. 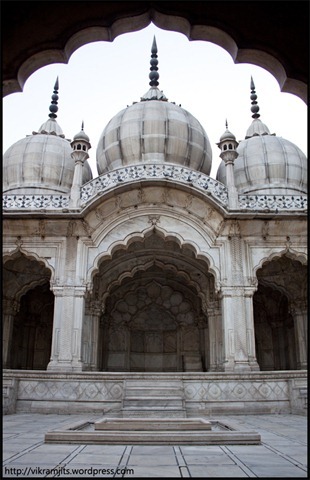 Part of the marble was to be sold to Indian nobles and rest was to be sent to Britain, for further sale. Idea of trying to sell majority of marble in India rather than in Britain came because an earlier attempt to sell marble from Red Fort of Delhi was not a successful. 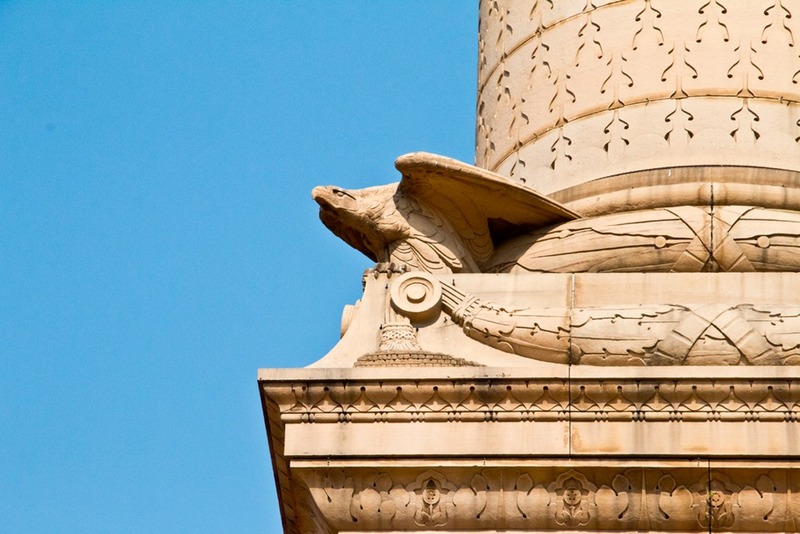 The cost of transporting marble to England came out to be more than the bid. 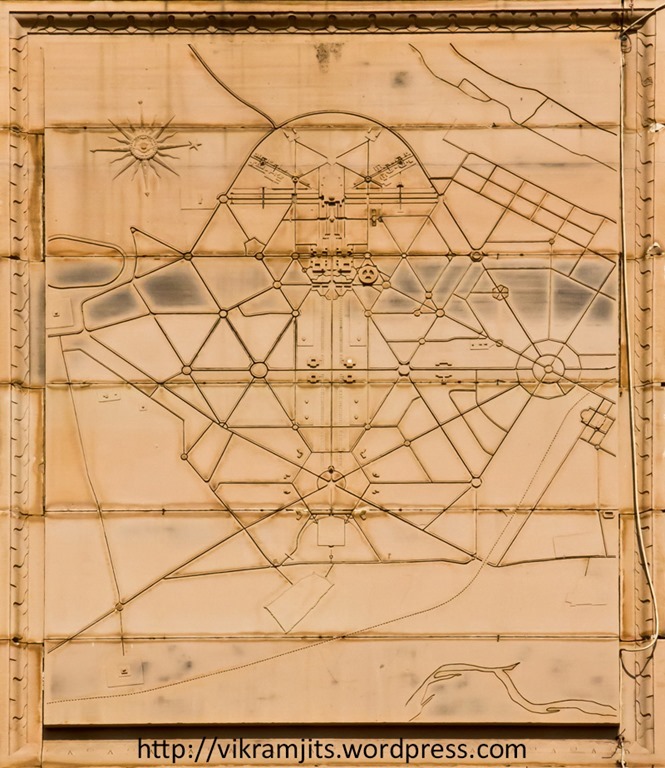 The British had earlier sold the Taj Mahal to Seth Laxmichand of Mathura for Rs. 1.5 Lakh, who, when reached the Tomb for possession, faced a major opposition from the Hindu and Muslim residents of Taj Ganj, the colony established by Emperor Shahjahan, which is said to have the descendants of workers, who made Taj Mahal. Seth Laxmichand had to retreat and the sale was called off. Then Lord Bentinck came with better arrangements and ensured that such problems do not hamper the auction. On July 26, 1831, an advertisement to sell Taj Mahal was published in an English daily of Kolkata. Auction started with seths of Mathura and Rajasthan. The next day, auction continued with English Bidders. Once again, the Taj mahal was sold to Seth Laxmichand for Rs. 7 lakh. But the cost of dismantling and taking off the marble was so high, that it was practically impossible to make profit out of it. Once again, the auction had to be called off. Lord Bentinck went back to his thinking table and finally managed to sort out the cost issue. Historian, Prof. Ramnath in his book ‘The Taj Mahal’, mentions about this incident. British author HG Cannes also mentioned about this incident in his book ‘Agra and Naibr Hoods’. They wrote Lord Bentinck finally managed to arrange an auction, which cannot be called off as all the hurdles have already been taken care off and this one was well planned. As the second auction was arranged, the seths and the British once again were invited. Then came into picture, an unknown soldier from the British Army, who secretly reported the matter to the Member Parliament of his constituency back in England. The matter was taken to the British Parliament and London office immediately ordered the Indian Governor General to give up this stupid idea. We will never know who this unsung soldier was, who saved the precious Taj and gave India its share in the list of Wonders of World. Much later, Lord Curzon, called for an auction on 7th February 1900. Many old paintings and precious carved stones, which included some material from Taj Mahal was auctioned. Even Lord Hastings had many precious stones from Taj Mahal sent to London. However, there have been incidents where looters didn’t bother to do the formality of auctioning. Historian E.B. Havell records that the Jats of Bharatpur, under Suraj Mal, carried away the fountains and the fish tanks of Machhli Bhawan of Fort. Later, other parts were taken by Lord Bentick for auction. Similar looting was done at Taj as well. 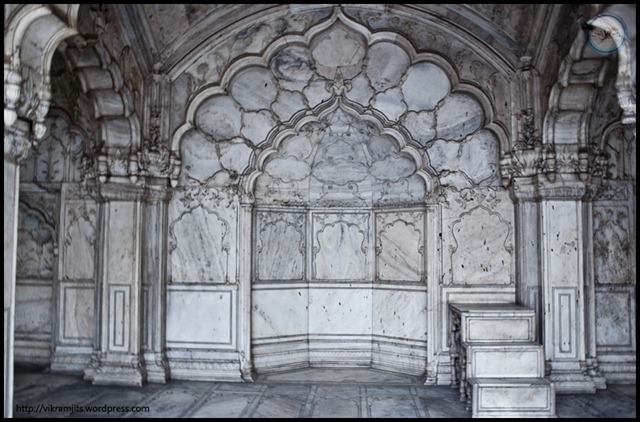 In 1784, the Jats carried away the silver doors of Taj, which were estimated at Rs 127,000, when installed by Shahjahan. They were studded with nails, the heads of which were silver rupees. Manucci writes, the first plunder of Taj took place in 1691, when Jats, under the command of Rajaram and Ramchhera took away great gates of bronze, studded with precious stones and plates of gold and silver. No matter what Taj has seen and suffered, it is still counted as one of the most beautiful pieces of architecture in Indian Subcontinent. Baoli is a stepped well in which there is a water source, which can be reached through a flight of steps. In Delhi region, these baolis are connected with a Well on one end and a long flight of stairs connects to different chambers at every level. The well has a small opening from where water fills in the water pit at the end of stairs. 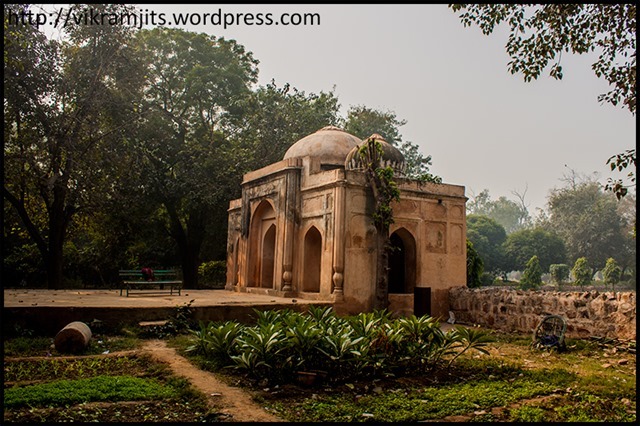 Few exceptions in Delhi, where there is no separate well, but the main pit of Baolis is the well itself are Nizamuddin’s Baoli, Hazrat Kaki’s Baoli, Feroz Shah Kotla’s Baoli and Tughlaqabad Baolis. Other famous baolis are Rajo’N ki Baoli, Gandhak ki Baoli, Ugrasen ki Baoli, Red Fort Baoli and Old Fort Baoli. Besides, there are lesser known Baolis like Loharheri Baoli (Dwarka), Talimabad School Baoli (Talimabad near Tughlaqabad), Wazirpur Baoli (RK Puram, Sector 5) and Muradabad Pahari Baoli (Muradabad Pahari near Vasant Kunj). Baolis are also known as Bawdi, Barav, vaav, bain and pushkarini. During british raj, they were written as ‘diving wells’ in all official govt. documents. Now let’s get back to our original topic. While I was doing my research on Baolis, I found several hidden baolis. But I also found references of Baolis, which were there till early 1900s and today are no where to be found. The most important of these are Palam Baoli and Khari Baoli. We may not be able to remove the dense settlement over them to unearth these buried baolis. But there is one Baoli, which we can still revive. This baoli is situated within the famous Lodi Garden of Delhi. To the N. E. of the Shish Gumbad are the remains of a garden, the four walls of which, brick built, are broken in several places. The double storeyed entrance is in no better condition. To the south of the latter is a mosque also ruined and neglected. The baoli in front of the entrance outside the enclosure is in the same condition. In the centre of the garden is a small brick built enclosure furnished with arched openings, apparently intended for a tomb but now containing no grave. The above two pictures are of the said entrance and mosque respectively. 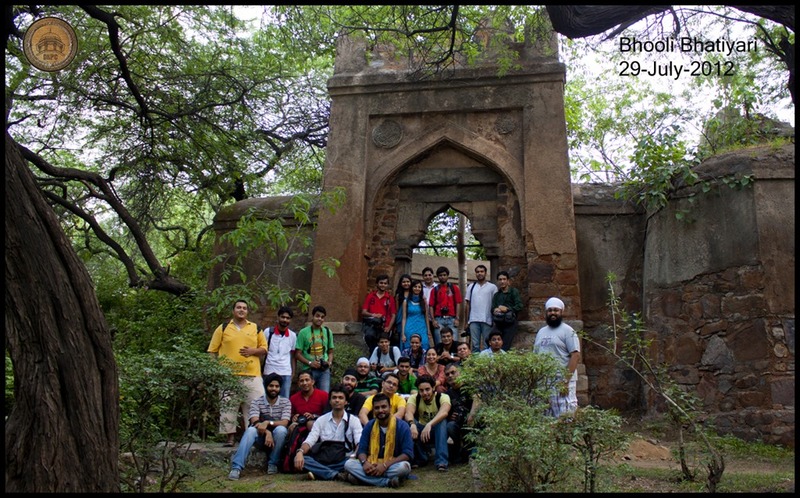 They are situated ~200 yards to North East of Shish Gumbad and ~160 yards to south of Lodhi’s Tomb. The picture on right gives a view of the garden reached through this entrance. Garden is used by people for their morning exercise. A Yoga camp is held here daily. Zafar Hasan’s listing suggests that this Baoli is not of any major importance. Hence, it is not important to protect it. Lady Willington, wife of Governor-General of India, Marquess of Willingdon, when landscaped this village and converted it into a beautiful garden for British officers, covered this baoli with earth and buried it forever. Upon inauguration on April 9th 1936, this park was known as Lady Willingdon Park. 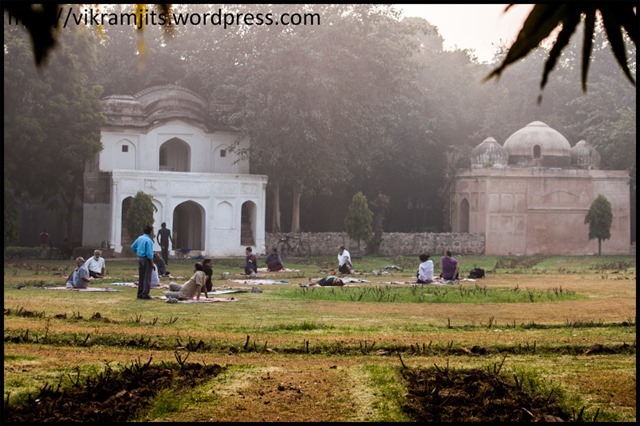 After Independence, Indian government renamed it to Lodi Garden. We know of a water stream running through this park, on which Athpula (bridge) was made. It is a possibility that the water stream be a ‘barsati naalah’ and gets filled only during rainy season. The land around this place must be having high water table at that time. Therefore, the baoli must not be very deep and given the fact, that the village here was not a very big or prosperous town, the baoli may not have any significant or distinguishing architecture. I however feel that if the government and the Archaeological Survey of India tries to restore this Baoli, it will be a great attraction for visitors. 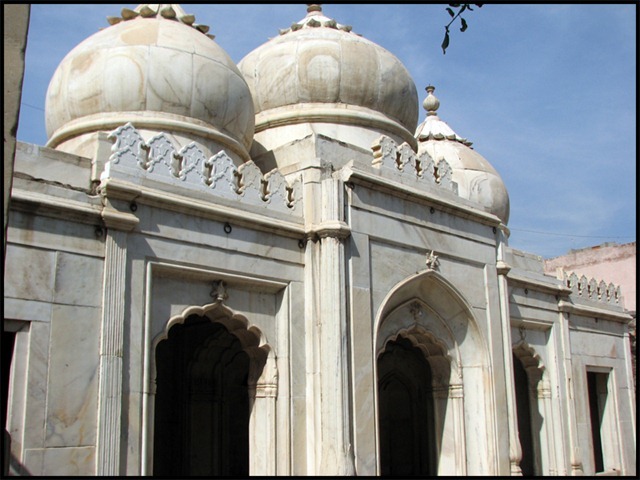 Khan-i-Jahan Junan Shah Tilangani, the prime minister of Feroz Shah Tughlaq brought a revolution in the Mosque Architecture of India. His creations were majestic, beautiful and well planned. Last month, I wrote about Jauna Khan, who later became Muhammed Bin Tughlaq and was widely misunderstood. Today I write about another Jauna Khan, whose wonderful contribution is victim of neglect and poor keep. 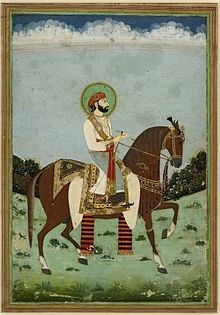 Gannama Nayaka, aka Yugandhar, the commander of Warangal was converted to Islam in 1323 by Muhammad bin Tughlaq (then Shehzada Jauna Khan) and made governor of Multan after the defeat of King Prataparudra of Kakatiya Dynasty. He was given the name “Malik Maqbul”, and soon became Masnad-i-Aali Ulugh Qutlugh Azam-i-Humayun Khan-i-Jahan Maqbul Tilangani. During the region of Feroz Shah Tughlaq, Malik Maqbul was made the Prime Minister and one of the highest paid ministers of Indian history with a salary of 13 lakh Tankas (silver currency of Tughlaq regime) annually and therefore earned the title of ‘Lakhtankia’. Not only this, he also succeeded in saving his office of Prime Minister for his son Jauna Khan (later known as Khan-i-Jahan Junan Shah, the hero of our story). Maqbool Tilangani named his son after his first master Junan Shah was creative, but a weak commander. He could not lead armies like his father. So he spent more time in constructing beautiful marvels for his architecture loving master Feroz Shah Tughlaq, which changed the way mosques were built in India. Unfortunately, he could not last long and was soon captured and executed in a conflict for succession. But during his tenure, he succeeded in constructing seven architectural wonders on 14th century Delhi. He built 7 mosques, which broke all the rules of mosque architecture known till then and established a new trend, which later spread to the length and breadth of Sultanate Empire. 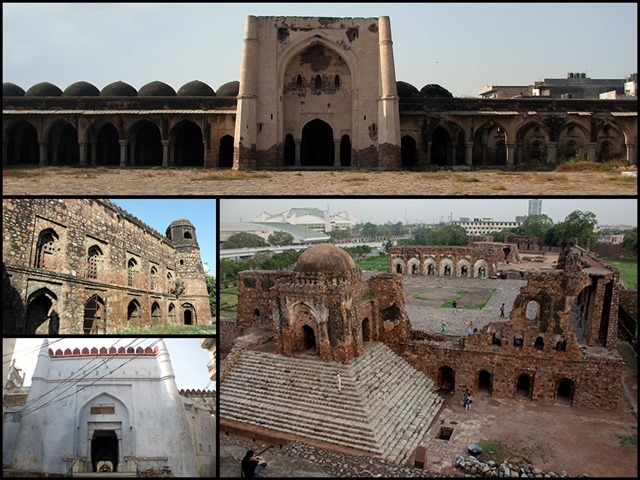 NOTE: Some historians claim that these mosques (or some of them) were built by Khan-i-Jahan Maqbool Tilangani (Malik Maqbool), whereas the ASI record correctly identify his son Khan-i-Jahan Junan Shah Tilangani to be the architect of these buildings. 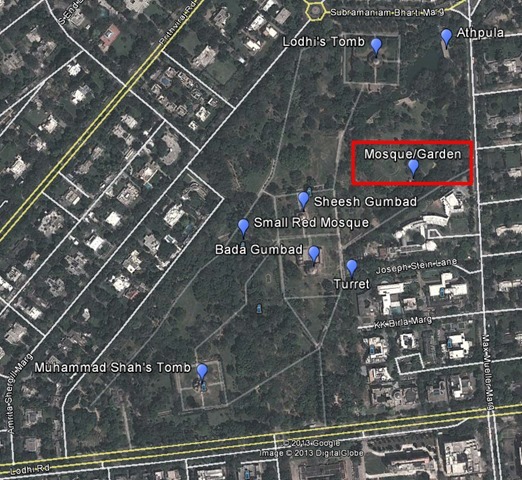 Hidden behind a thin row of small shops right opposite the famous shopping malls of Saket, it’s a 288 feet long and 288 feet wide square-shaped Mosque with 11 feet high basement containing 100 cells. It’s 81 domes stand on 22 feet high 180 columns and 60 pilasters and it has 15 Mihrabs (arches on praying wall). There are three huge gates on north, south and east sides. But what’s most important is that this was the first mostly covered mosque of India. It has four openings in the roof to let sunlight come in. The only fully covered mosque built during that time was that in Gulbarga (Karnataka), which was built few years after completion of Khirki Masjid by a Spanish Architect and is smaller in size. 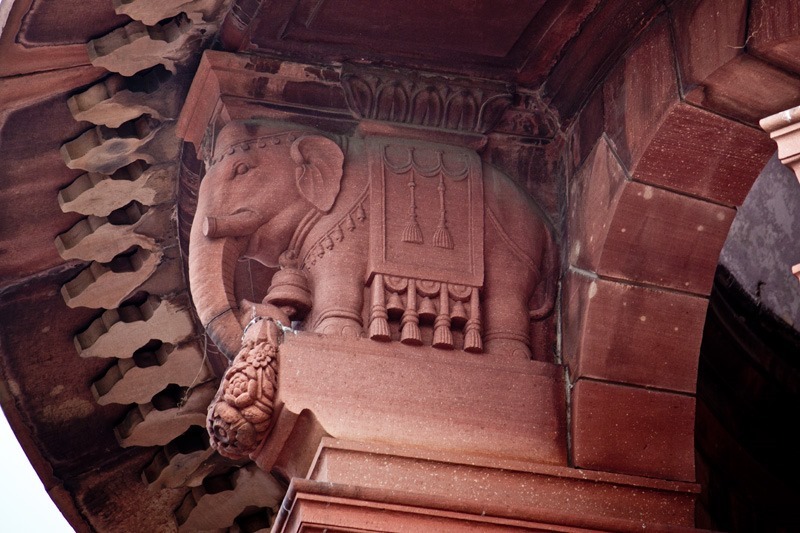 In order to ensure proper ventilation, Junan Shah built red sandstone windows instead of walls, from where the mosque got its name “Khirki” (meaning window). 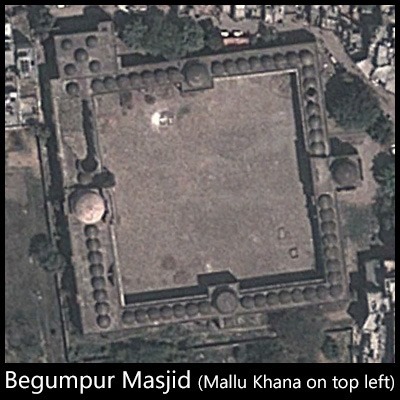 Unlike Khirki, Begumpur mosque is single storied and is slightly bigger in size (308’ X 289’). It has total 68 domed compartments and a huge open court. The main Pishtaq (central arch), which is the most prominent feature of the building is flanked by sloping buttresses each containing a winding staircase leading to the roof. There is an attached Mallu Khana, which is an independent mosque for ladies and also has a Taikhana. Mallu khana is accessible from a very small opening in North wall, where you have to kneel to get through. I have not seen or heard of any mosque from that era, which contains such a huge and beautifully decorated mosque for women, attached to the main mosque. Mallu Khana is approx 1/4th of the size of Begumpur Masjid and has beautiful Mehrabs and Windows. An entire village was settled in this Mosque at one time. British forced the villagers out, and who established their small houses along the walls of this mosque, but within the Lal Dora. 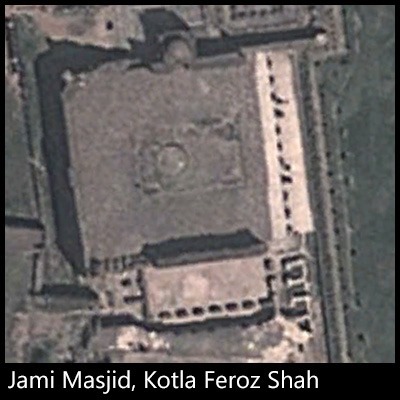 Jami Masjid of Kotla Feroz Shah is a combination of both Begumpur and Khirki Masjid. Its uniqueness is the material used, which is local quartzite rubble, externally rendered with limestone, originally of a dazzling whiteness and giving the effect of marble. It contains a huge open courtyard with thick walls with open arches. Lower level of Mosque contains Taikhana with a series of cells, which are now habitat of bats and are illuminated with earthen lamps and incense sticks as locals believe this place to be the abode of Djinns. A very huge circular pit covers most of the courtyard of mosque, which is assumed to be a well (unlikely for any mosque to mark such huge space for ablution zone or wazoo-khana right in the middle of the courtyard). There was a unique octagonal dome over this well supported by 260 pillars of 25 feet in height. 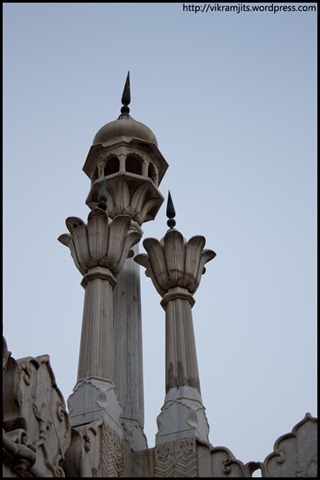 Documents suggest that these pillars were removed and used while constructing towers in the wall of Shahjahanabad. Amir Taimur lung (Tamerlane) was so impressed with this grand mosque of Delhi, that after offering his prayers here, he took 200 craftsmen from India to build a similar mosque for him in Samarqand. Few of them were rewarded for their service but many were beheaded for negligence after completion of mosque. This mosque today stands proudly as Bibi Khanum Mosque of Samarkand,Uzbekistan. 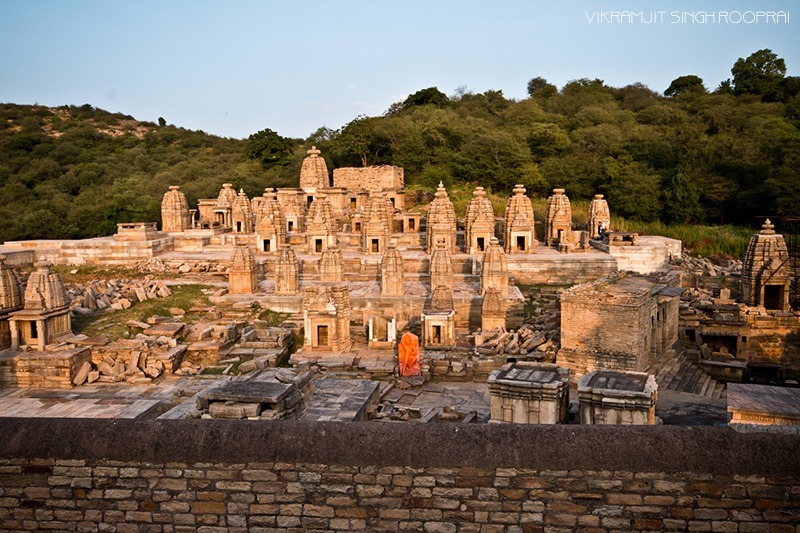 This is another marvel by Junan Shah, but now in ruins. It fell into the hands of locals and in last 2 centuries, pieces of the mosque have been falling down. Only few arches are left and original size or design of this mosque is no longer known. Some historic travellers mention of this mosque as a magnificent piece of architecture. The main building is now consumed by row houses and while walking down the tight lanes, one can see remains of arches and walls. However, it is assumed that the portion shown in this picture was the original area of mosque. This is the huge active mosque near Turkman Gate of Shahjahanabad (Old Delhi). It is a double storied mosque with double-apartments in the basement, which are till date used by locals. This is an active mosque and so badly surrounded by row houses, that the original façade of Mosque is totally hidden. As you can see from this picture, it is half covered and has domes all over it. the green circle on the eastern wall is actually the green dome of projected entrance, which is reached through a flight of stairs. From inside, the mosque is now beautifully plastered and coloured, while the floor is decorated with marble slabs. The exterior however is white washed and thankfully, the mosque management committee is taking good care of the place. 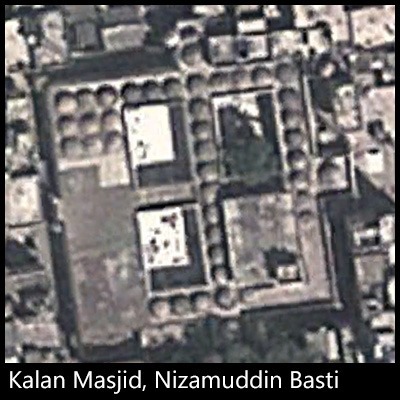 This mosque from Nizamuddin Basti is an architectural replica of Kalan Masjid of Turkman Gate from outside. From inside, the difference both mosques have is in the partition of courtyard. 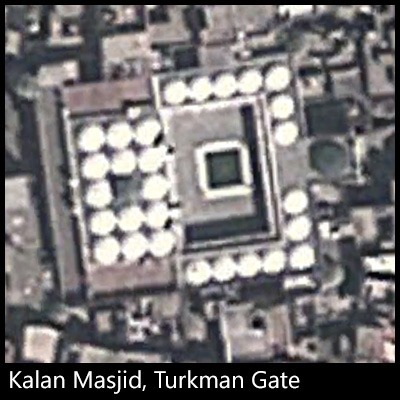 Turkman Gate Kalan Masjid has half of the courtyard covered, whereas this one has a cross section (as appears in image on left) and has multiple domes over it. The lower right corner (South East) is now covered, which is a modern repair work. Its original name is also Kalan Masjid (huge mosque), but with time, the name got corrupted to Kali Masjid (black mosque). This mosque has multiple entrances and numerous domes but most of them have been repaired beyond recognition by local caretakers. When I went there last, I saw piles of building material as some repair work was going on. 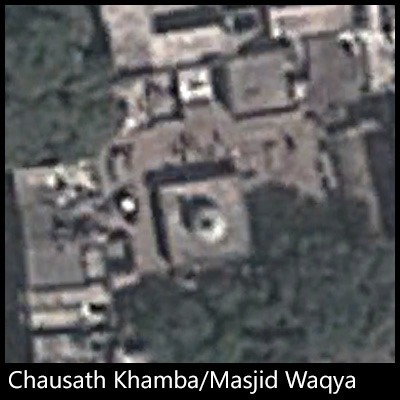 Most of the domes of this mosque have collapsed and caretakers have constructed plain roof in place of broken sections. 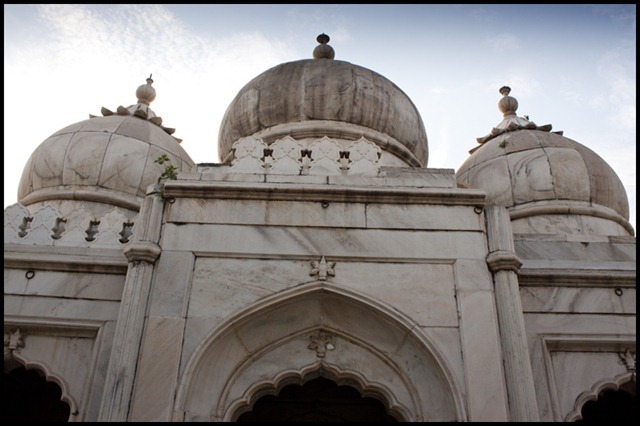 Also known as Chausath-khamba Masjid (Mosque of 64 pillars), this mosque is situated on Mirdard Marg near the Maulana Azad Medical College. 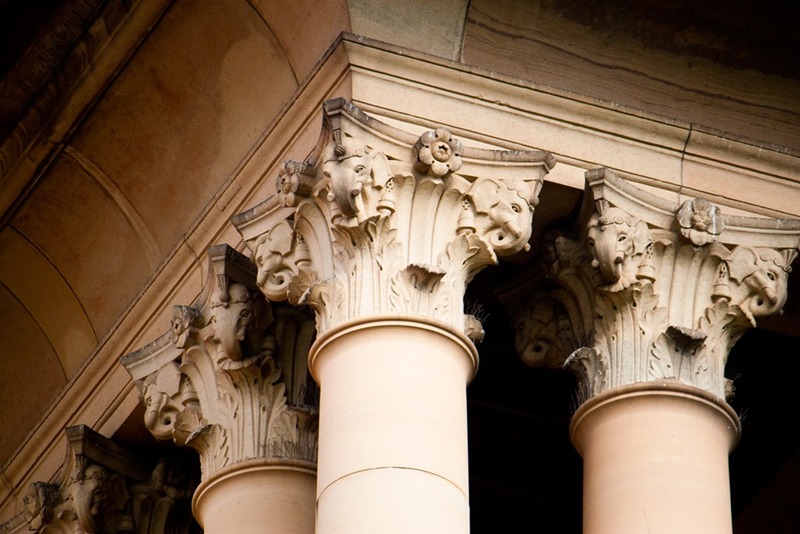 Its 64 pillars are made of White Sandstone and supports a huge roof over its 64 pillars. This is an active mosque and rarely known to the outside world. As far as size is concerned, this is a much smaller mosque (as compared to other 6 mosques of Tilangani). However, nowhere else he built a proper Chausath-Khamba before this. It is pity that this marvellous architect was brutally murdered and the revolution he brought to Indo-Islamic architecture had a major setback. When we say Moti Masjid (Pearl Mosque), the first image that comes to our mind is the small box-shaped mosque inside the Red Fort, which we never get to see from inside. But fact is that the last Mughal Emperors built another Moti Masjid in Mehrauli. These mosques were built as the private chapel of the emperor and his family. 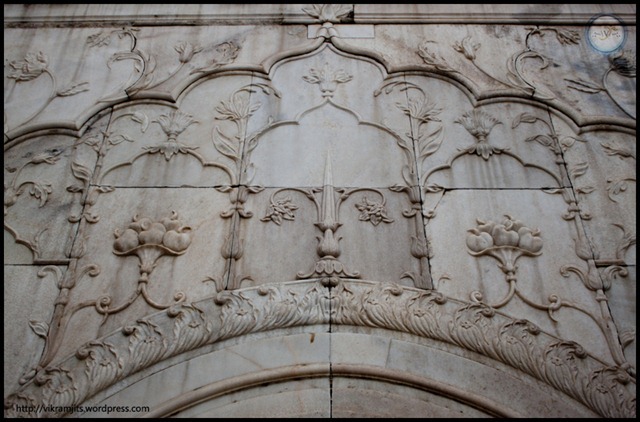 You will find Moti Masjids in almost all Mughal Palaces This article is about these two beautiful marble pieces of history from Delhi. 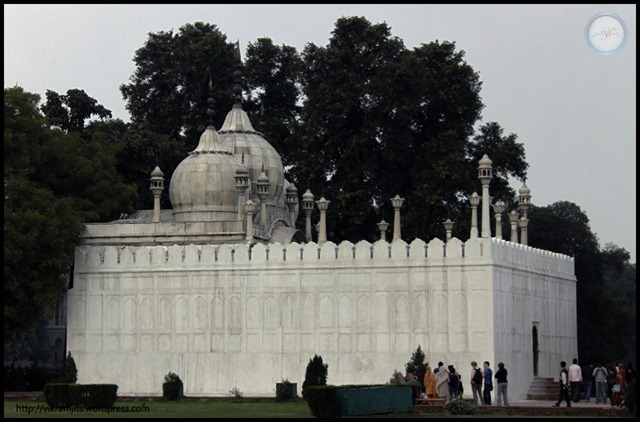 The Moti Masjid of Red Fort was built by Aurangzeb. He did not miss his prayers and the Jama Masjid (merely 600 mts. 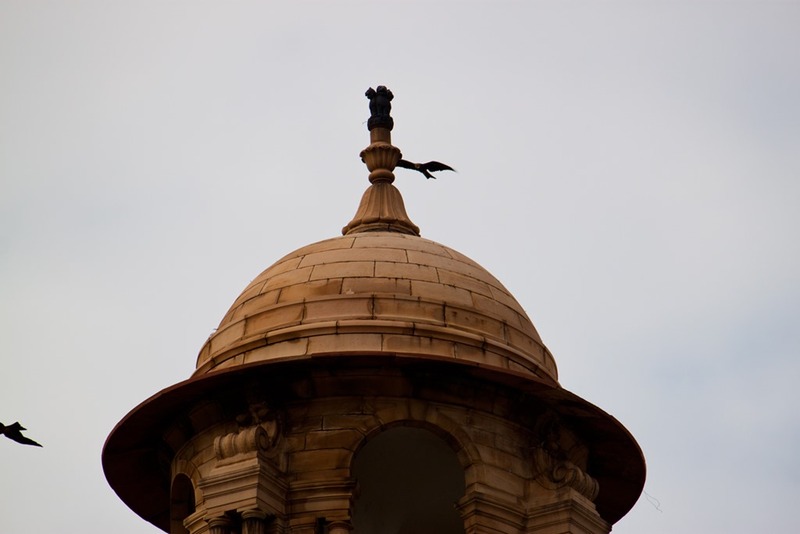 from Badshahi Gate of Red Fort) was probably too far for him. So he commissioned his own private mosque and decorated it with nice white marble. Originally this mosque had golden domes but they were severely damaged during the mutiny of 1857. This mosque was built at a cost of 160,000 in 1659 AD. It is situated to the west of Hammam. The female of harem were also allowed to attend prayers in it. The main entrance on eastern side has a small door with decorated copper plates nailed to it. There was originally a door in the northern wall for women, but during the repairs after 1857, it was closed. Archaeologists at that time were not able to restore the original domes with their Copper plates, but did good work restoring the Pietra Dura (embossed artwork on walls). It also has a small ablution pond (wuzu-khana) in the centre of courtyard. The Moti Masjid of Zafar Mahal in Mehrauli is not as beautiful or as big as the mosque of Red Fort. But it serves the same purpose of offering a place to offer prayers to the royal family. 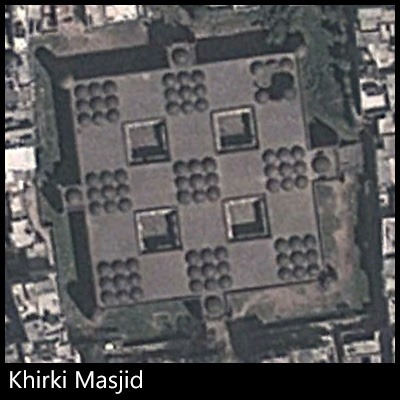 It has similar three dome structure and have marble patterns on Mussallas(Praying Mat) on floor. 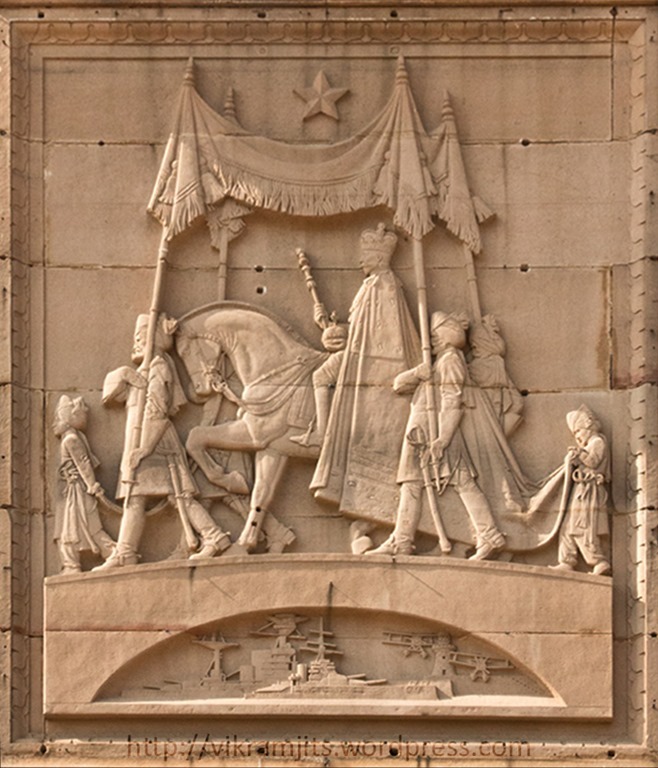 There is hardly any embossed artwork (Except for flowers near the keystone of arch and some floral patterns near ground). The only beautiful thing about this mosque is that it is to the immediate west of the Dargah of Hazrat Khwaja Qutubuddin Bakhtiyar Kaki (ra). A small wall separates the courtyard of Mosque and the Dargah. 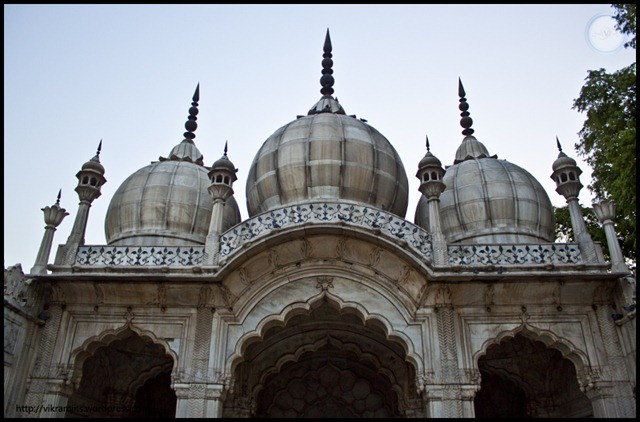 This mosque was built around 1707 by one of the last Mughal Emperors. Only one minaret of this mosque survives in shattered state, and which is now supported by external scaffoldings to avoid its collapse. The dome with stairs in this picture is of the Dargah Sharif and the triple marble domes are of the Moti Masjid. 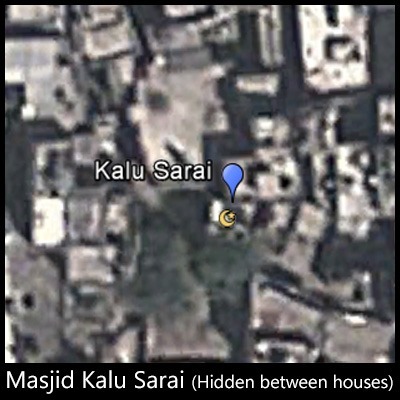 This pic shows the distance between the Mosque and the Dargah. On the lower right corner of picture, we can see the sardgah, the enclosure containing graves of Emperor Akbar Shah II and the empty slot, where Bahadur Shah Zafar wanted to be buried. One door of the mosque opens inside the Dargah complex, and is usually kept locked. This palace (Zafar Mahal) was built adjoining Dargah of Hazrat Kaki, when Akbar Shah II started the famous Sair-e-Gulfarosha’N (Phoolwalo’N ki sair) festival of Delhi. Royal family along with other nobles from Red Fort used to stay in this palace during the 7 days of festivities. Today, these mosques lie ignored and silent.